We cannot do our lifesaving work without the help of our partners. We work with a wonderful network of veterinary clinics, rescue groups, and corporations that help us make a difference for animals in need. ​a forever home at their animal sanctuary. I'm proud to support this wonderful organization." Adopt A Pet.com is a nonprofit pet adoption charity that helps shelters and rescue groups advertise their homeless pets to potential adopters in an effort to get homeless pets in homes. Petfinder is an online, searchable database of animals who need homes. It is also a directory of more than 13,000 animal shelters and adoption organizations across the U.S., Canada and Mexico. Animal Acres is a Los Angeles farmed animal sanctuary and compassionate learning center dedicated to rescuing and protecting farmed animals. Ten Golden Rules is an internet marketing agency specializing in internet marketing strategy, online advertising, web marketing and conversion. 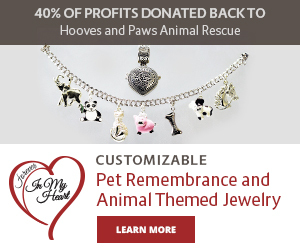 Hooves & Paws Animal Rescue is proud to be a Partner for Pets! BISSELL and LostPetUSA.net have teamed up to help organizations like ours raise money, and now you can help too! When you purchase pet products on bissell.com and enter the code ADOPT at checkout, a portion of your purchase will be donated to our organization! Camillo Longo donated his professional photography services to our organization and has provided wonderful photos for our website. The Kaplan Group, Inc. is a B2B collection agency founded in 1991. When you have delinquent business customers, call us to get paid! We work on a contingency basis, so you don’t pay anything unless we collect. We will donate 10% of our fee to Hooves & Paws, just mention Hooves & Paws when you call us for a quote. We love dogs and want to help animal rescue efforts in the Los Angeles area. Pig Harmony was established to help with Pot Bellied Pig adoption and placement needs. GoodSearch is a search engine which donates 50 percent of its sponsored search revenue to the charities designated by its users. It is powered by Yahoo! You can use GoodSearch as you use any other search engine. The money GoodSearch donates to your cause comes from its advertisers. Forgotten Angels Cat Rescue is a non-profit cat rescue founded by volunteers dedicated to making a difference in the lives of unwanted and abandoned cats. The Gentle Barn was created to rescue, rehabilitate and give sanctuary to abused animals.